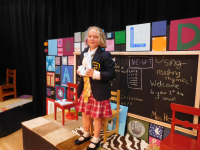 Three and half weeks ago, while we were still at the beach, I received the sound files and lyrics for the songs June needed to learn for her musical drama camp production of Matilda. But she was too busy having fun to practice much while we were on vacation. As tryouts were the first day of camp (a few days after our return), the day we left I urged her to listen to the songs in the car and sing along “for as long as you can stand it.” Little did I imagine she’d sing for nearly the whole drive home. She put a lot of heart into it, especially certain lines like, “If you’re little you can do a lot./You mustn’t let a little thing like little stop you.” I think she identified. But there were other lines that resonated with me during the two weeks she was at camp and I was hearing a lot of them. Here’s a bit of “When I Grow Up,” I particularly like: “When I grow up/ I will be strong enough to carry all/the heavy things you have to haul/ around with you when you’re a grown-up.” There have been a lot of those things lately, haven’t there? Multiple high-profile police shootings, both police on civilians and vice versa, a terrorist attack in Nice and another one in Kabul, an attempted coup in Turkey and the Turkish government’s response to it, the shooting in Munich, and the truly alarming spectacle of the Republican National Convention. I had more personal worries as well. It may seem small in light of national and international events, but our cat Matthew has lost weight and he passed some bloody stool and I went on the Internet and found it could be anything from constipation to cancer, and so for a while I was very worried about him. We took him to the vet twice and they palpated his belly, and took blood the first time and urine the second time. Everything came back normal, but one of the times I was at the vet’s office there was a father with two girls there collecting the body of their cat, who had been put to sleep during exploratory surgery for cancer, so it felt like a near miss indeed. And we’re still not sure what’s caused his symptoms, so I have some lingering unease, even though he’s acting normally. Meanwhile, while June was at drama camp, Noah was home most of the time doing his summer school computer science assignments, as well as summer homework for pre-calculus and English, and helping me with housework and yardwork. This year we let June walk to and from drama camp. She did this with another day camp nearer to the house last year, but this represented an expansion of her roaming range and it also involved crossing a slightly busier street than she’s ever crossed before. I took her to camp the first day because I needed to turn in a form, but that afternoon she came home red, sweaty, and proud of herself. About half the time, I ended up taking her on the bus in the mornings, but most afternoons she came home alone, sometimes buying herself a snack at a convenience store on the way. The last few days of drama camp Beth was away for a several days at Netroots Nation in St. Louis. This conference was inconveniently timed because she wasn’t available to drive Noah to his summer school computer science midterm in Gaithersburg, she missed our twenty-ninth dating anniversary, and worst of all, she would miss Matilda. Noah successfully took a cab to his midterm, which inexplicably turned out to be a mid-class review session and not the test they were told they would have. Then he found his way home on public transportation on an unfamiliar route (bus to train to bus). Even though he was irritated that there was no test and felt like the whole thing was a waste of half a Saturday, I thought it was a good life skills experience. As a kid with a non-driving parent, he’s had to be pretty self-sufficient about getting around, but the cab was a new twist. As for the anniversary, Beth and I exchanged gifts after she got home, a couple days after she got home actually because she was pretty busy. Before she left on her trip, she told me she’d had a good idea for me and forgotten it, so I asked if she’d been planning to get my Birkenstocks resoled because they need it and she’s done that before. No, it wasn’t that, she said, while Noah stage-whispered, “Go with it.” She took his advice and gave me a card with before and after pictures of Birkenstock soles tucked inside. I got her some wind chimes she’d admired. My aunt Peggy got us some at the beach as well, so now we have two new sets on the porch. On the day of the performance, we met June’s best friend Megan in the auditorium. She was going to watch the show and come home with us for an extended play date, which would start at our house and then switch to Megan’s house for a sleepover. Noah set up his video camera on his tripod and I reminded Megan, who kept up a pretty constant running commentary during the Frozen performance last year that she had to keep quiet because unlike last year, we were all sitting together and she was near the camera. Megan promised she would and she was true to her word. She whispered everything she had to say. The first song was “Miracle,” in which a group of spoiled children sing “My mummy says I’m a miracle” and other expressions of parental overindulgence, to be contrasted with Matilda’s sadly singing, “My mummy says I’m a lousy little worm/My daddy says I’m a bore.” The kids were in different costumes, a ballerina and a soldier are called for in the lyrics, but for some reason June wore a dog costume. She was not able to offer much of an explanation for this, but I think it must have been meant to indicate a child whose whims are humored. The choreography in this number was more complicated and ambitious than they’ve tackled in previous years. In some of the other pieces they used parts of the Broadway choreography, but this was the camp director’s invention. 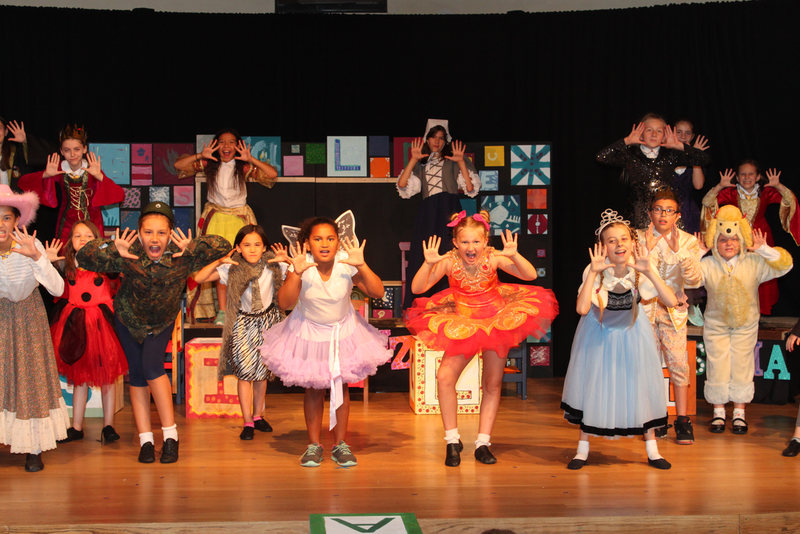 June had her solo in the first lines of the next song, “Naughty.” The camp director, Gretchen, complimented her after the show for “setting the tone” well in this song. Here’s a clip of the first two songs of the show. For the rest of the show she was singing along with the group, with an occasional line of dialogue. June especially liked the part where they rode scooters up and down the aisles of the theater. The show was well done, as usual. This year the girl who really stole the show was one of the director’s daughters, who was playing Miss Trunchbull, the evil headmistress. Lottie really nailed that role. This camp is always a highlight of June’s summer, but the kids’ artistic endeavors were not over. The next week Noah volunteered at a day camp at the kids’ old preschool and he filmed and edited a zombie movie there, with the campers as actors. It was unscripted and pretty much consisted of him filming their play. He played it for them on the last day and it was a hit. This is a link to the camp director Lesley’s blog post about the whole zombie experience. The movie is included in two parts. That same week June was away at Girl Scout camp and the theme of her program was “Artistas,”so she came home with a lot of art, including a tie-dyed t-shirt, a lot of ceramics, and a bracelet she made for Megan. We were there at five on the dot, and when they called June out of the dining hall where the girls were waiting, she barreled out to give us hugs. 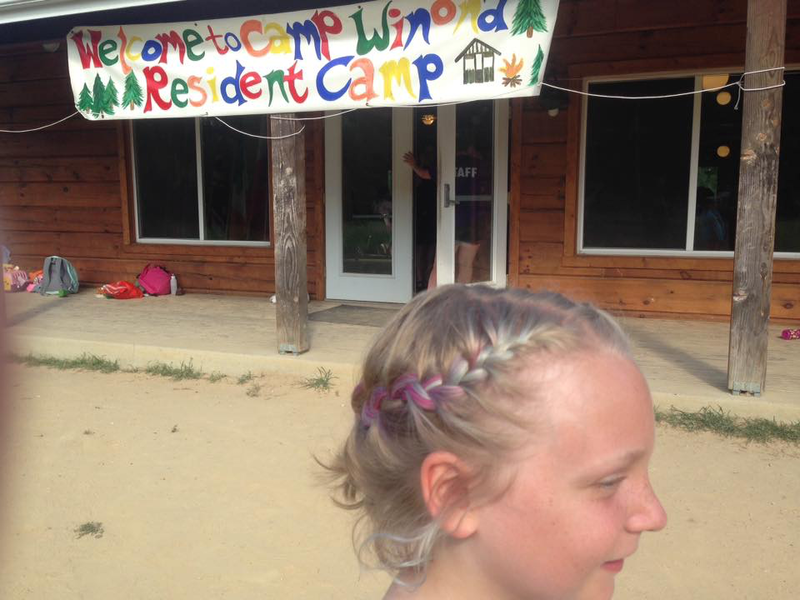 Her hair had been French-braided by a counselor, no mean feat given how short it is, and even better, the counselor managed to do it so that most of the faded blue and pink left in her hair from having it dyed two months ago was is contained in one of the braids. It was a cool effect. On the drive home and at dinner—we stopped at Pizza Hut and then Rita’s for Italian ice and frozen custard—she told us about camp: she’d been canoeing and had done archery once each, they did an art project and swam every day. She’d been in the lowest swim group for the second year in a row, despite having taken swim lessons this spring to avoid this fate. She mostly liked the food, and tried Apple Jacks for the first time ever, but the vegetarian lasagna was worse than last year—it had eggplant instead of noodles! (Beth surmised it was doing double duty as the gluten-free option.) She learned the camp is inhabited by mermairies, mermaid/fairy hybrids who grant wishes. She made a wish (to find her missing swim bottoms) and it came true. She thought she might have spotted a mermairy’s head in the pond while canoeing. One of her best camp friends lives in Silver Spring and she got her phone number so they can have a play date. She missed us but she didn’t get homesick. All in all, June was very happy with her camp experience and we are happy to have her back. Even if she’s grown up enough to spend a week away from us without much worry or fuss, it’s still good to have her home. Then on the weeks when June doesn’t have camp, there’s the scramble for babysitting and the stress of trying to work while she’s at home. I haven’t actually had that kind of week yet this summer because June’s been in camp five weeks out of six and we were on vacation the other week. But as of Friday she’s finished her last camp. Noah has one more week (a week of theater design, starting Monday). While he’s doing that, June will be having a three-day visit with Beth’s mom in West Virginia and then the next week we all head to Oregon to see my folks. The last two weeks of break neither kid has camp. I’ll be working, but fewer hours and I think knowing it’s the very end of break I’ll be more motivated to be the kind of summer mom I often wish I could be, full of fun projects and outings or lazy afternoons reading or playing cards on the porch. Transportation was my main challenge this week. Early in the summer Noah was volunteering at June’s tinkering camp (located at their old preschool) and he walked her to and from camp most days. It worked out so well I had him handle about half her drop-offs and pickups to musical drama camp the next week and a couple of the art camp drop-offs the week after that. The first day they walked off the front porch steps together, June thrilled to be heading out into the world alone with Noah, and Noah seeming quietly pleased at the responsibility, I had to stop myself from running down the block after them. But it was amazing how quickly I got used to the convenience. Soon they were stopping at a pizzeria on their way home and bringing home pizza for dinner, and riding on public transportation together as if they’d been doing it for years. And this week, when he had band camp and couldn’t pitch in with June’s transportation, I really missed the help. I had to remind myself that when he was eight, I would have been getting him at camp every day while wrestling with a stroller, a diaper bag, and a nap-deprived tantrumming preschooler on the bus. So it really does get easier, I assure you, if you are currently raising small children. That said, I will note for the record that my circumnavigations between June’s drama camp, the library, June’s music school, and one trip to Noah’s band camp took me on twenty-two buses and six trains this week. And some of them were late, as is inevitable when you take that many buses and trains. Yet I was never late for a pickup or a drop off (well, once, by about three minutes, but does that really count?) and I only lost one SmarTrip and one umbrella. I think that’s a decent score. But what I really intended to write about here was band camp, or mostly the band camp concert, as I was there but I was not at band camp. Camp started on Sunday afternoon with a three-hour orientation. In addition to daily sectional practice with the other percussionists, Noah was taking three electives—technology, movie music (his friend Sasha was in this one with him), and composition. He was glad to get into that class because he’d wanted to take it last year. 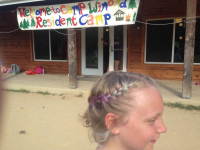 Camp lasted from nine to four Monday to Friday and ended with a ninety-minute concert (thirty minutes for each age group) on Friday afternoon. The truly impressive thing about this camp is how they pull together a polished-sounding concert in just a week. On Sunday night at bedtime, Noah said, “I should have practiced.” I asked if they’d been instructed to and he said no, but he thought he should. I was heartened to hear this, as he hadn’t touched his drums all summer and I’d hoped he would, if just to fool around with them. Anyway, for the rest of the week after a full day of band camp, he practiced, mostly on his orchestra bells, which were standing in for the marimba and vibraphone he’d play in the concert. He didn’t tell me much about camp and Beth, who was driving him and Sasha there every morning, said they were not talkative in the car either, but he seemed happy. Friday afternoon I picked June up from drama camp an hour early to take her to Noah’s concert. She had to miss her own performance but we’d decided earlier in the summer that each child would have one performance that everyone in the family would attend. For her it was Cats; for Noah it was band camp. Because the campers spent the afternoon rehearsing skits June would not perform in, the counselors gave her an “assistant director” role. She sat in the back of the room and told actors when they needed to speak more loudly. She seemed pleased with this duty. 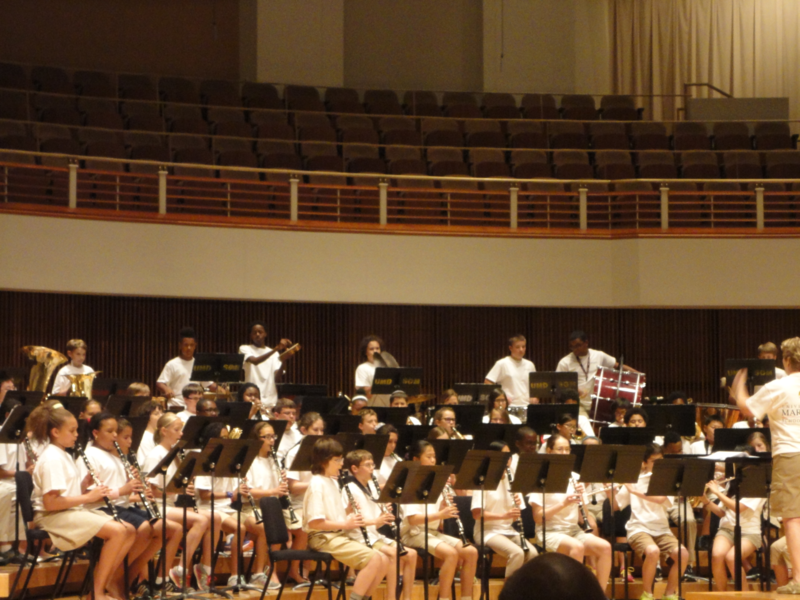 The fifth and sixth grade band went first. Among their numbers were “De Colores,” which made Beth and me smile because if you have two children attend a Spanish immersion elementary school you get to know this song very well. They also did “Do You Want to Build a Snowman?” which I thought would be June’s favorite, but she said she liked “Creatures in the Attic,” which was full of spooky sound effects. We finished our chapter while we waited for the seventh and eight grade band to take the stage. The conductor came on stage holding a large goose puppet. Noah later explained he did it so if any of them made a mistake they would know they were not the only ones who were embarrassed. As I mentioned, we could see Noah better than usual, although I couldn’t always make out what he was playing if it was at waist level. The triangle and cymbals were pretty visible. (He’s the one playing cymbals in both pictures.) Consulting with him later I found he’d also played cabasa, wind chimes, and vibraphone. He liked “The Falling Rain” best. He played cabasa and wind chimes in this one and there was audience participation—we had to snap when the conductor signaled for it. I liked “Cyclone,” but maybe just because the week I’d just had felt like one. I was thinking as they played about a question a friend recently asked me about Noah and percussion. I’d been explaining Noah’s slow processing and how it causes him difficulty at school sometimes. Kevin wanted to know how he plays drums if it’s all about timing and doing things at exactly the right time. 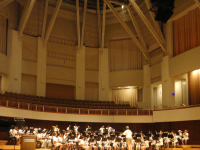 I said I thought it was practice, that by practicing a piece over and over he learned how to come in at just the right place, which might be part of the reason he finds it satisfying, as coming in at the right time can be challenging for him, say, in class discussion, and you don’t get do-overs then. I remember how when he was just starting to play, when he was nine, how every new song used to frustrate him—sometimes to the point of tears—because he wanted to be able to play it right immediately and he couldn’t. He’s still a perfectionist and could tell you every mistake he made in concert if you wanted to know, but he takes it in stride now. He knows mistakes come with the territory. Plus there was a grown man with a goose puppet on stage, so how could he be embarrassed? 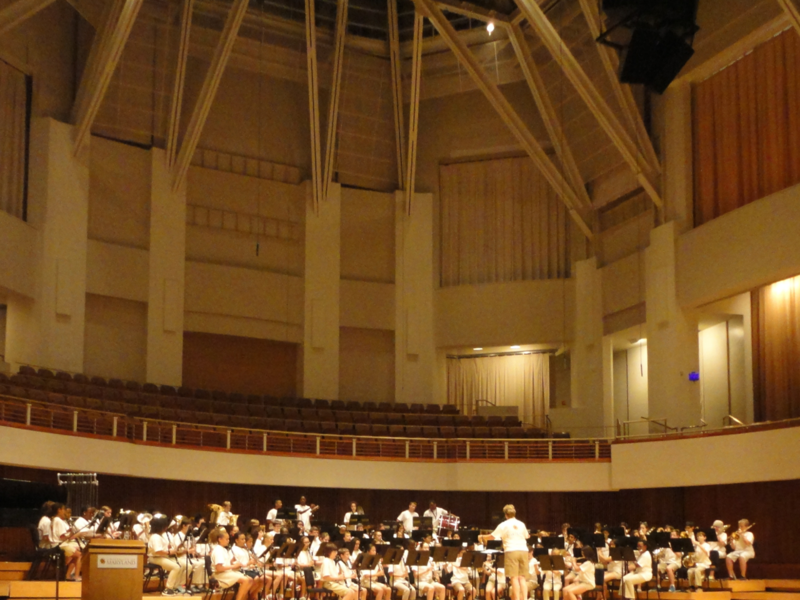 The ninth and tenth graders finished up the concert. Their last piece was called “Instant Concert” and consisted of snippets of well-known songs all strung together. “Thirty melodies in three minutes,” the conductor said. Hearing “Jingle Bells” and “Deck the Halls” in July made June laugh, but every familiar tune was fun to identify. Here’s the full list. After the concert we had pizza at a place I used to frequent when I was in grad school at the University of Maryland and then ice cream. And so began a busy weekend featuring getting our middle-aged long-haired cat Xander shaved because he can’t reach his back to lick it any more and he had gotten mats in his fur, our annual berry picking expedition (always to the same berry farm) and my annual blueberry kuchen baking that follows said berry picking expedition, the kids running a lemonade stand/bake sale to benefit endangered species—June’s friend Megan helped with this—and music lessons for both kids. In fact, on Friday night, going to bed, Noah said he thought he’d play his drums in the morning. The next morning he had his first summer drum lesson—one of several he’ll have at June’s music school over the next few weeks to tide him over between band camp and the beginning of the school year. Even though he’d been playing percussion all week he’d never actually played a drum and he said he felt rusty. Sure enough, Saturday morning around nine-thirty, I heard the controlled chaos of Noah’s drumming rising from the basement. Noah and I are alike in many ways. I know my tendency to get rattled by admittedly small changes to my routine and my (closely related) need to think everything through carefully is just a milder version of his emphatic need for routine and his information processing challenges. 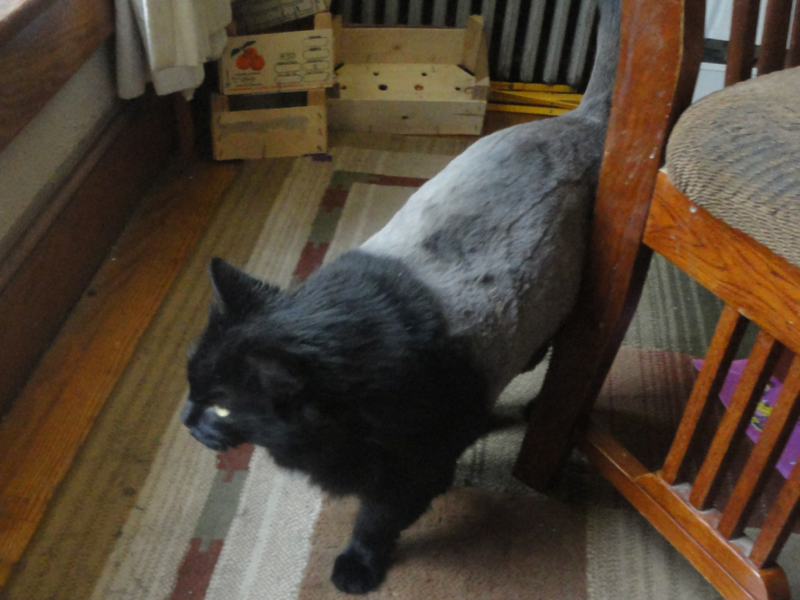 Even one of our cats, Matthew, can’t bear change. Ever since Xander got shaved, Matthew’s been hissing and running away whenever he sees him, which leaves Xander looking completely baffled because it’s not their usual dynamic. I’m hoping it’s just the lingering smell of the shampoo the groomer used because his fur won’t grow back completely for four to six months. By then, I will be out of the cyclone and back in my comfortable school year routine and Noah will still be providing the steady back beat in the soundtrack of our lives. We have two cats, Matthew and Xander. They’re brothers, from the same litter. We got them the summer Noah was two, from the county humane society. The shelter said they were four months old but I didn’t believe it. They were much too big to be that young, I thought. But then they grew and grew and grew and soon I realized it was no error. They are now ten years old, big, black, golden-eyed cats. They look similar to people who don’t know them well. To me they look different: Matthew has short, smooth, glossy fur and he’s black all over, while Xander’s fur is medium-long and fluffy, with a white patch on his chest and another on his belly. After their rambunctious kittenhood, personality differences began to emerge as well. Matthew is shy of strangers, prone to anxiety, and a homebody. He’s happiest curled up with Beth or me or the kids while we read in bed. He ventures outside occasionally but he wants back in the moment the door closes and he never leaves our yard. 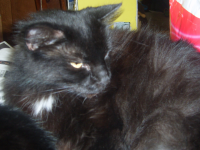 Xander is bold and friendly, twining around the leg or jumping into the lap of almost anyone who comes into the house. The video of our wedding includes a moment when Dan stops officiating the ceremony and bends down to pet Xander, who’s rubbing up against him. Xander spent the night outside on Monday. 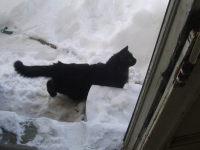 This is not unusual, though in the winter I do try to see if he wants back inside before we go to bed. By Tuesday night he hadn’t returned and that was strange, especially given the cold, wet weather. (It hailed that morning.) By Wednesday Beth and I were both quite worried. He’d never been gone two nights in a row. 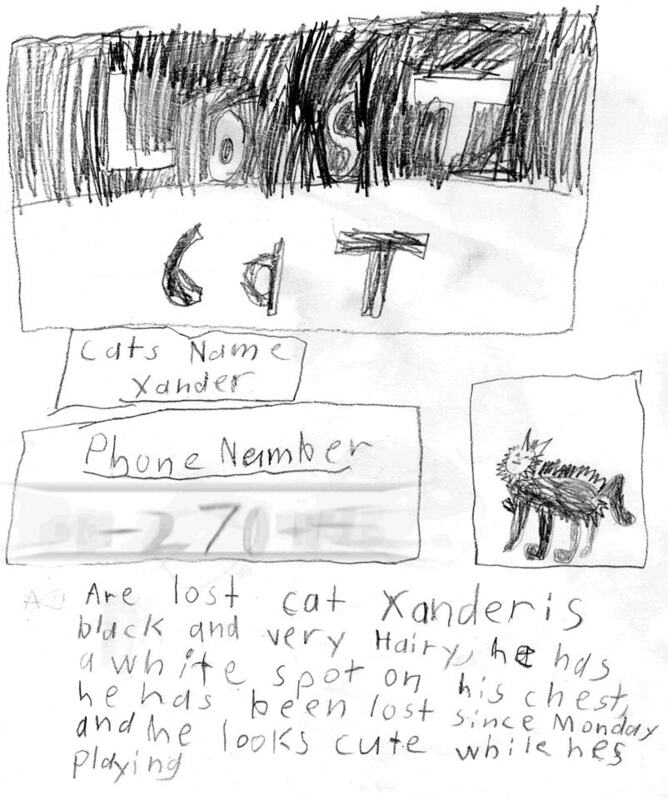 Beth reported him missing to the micro-chipping company and they contacted local shelters with his description, screened leads and passed them on to us, and generated posters we printed and put up around the neighborhood and distributed at June’s school bus stop. As June and I tacked posters to telephone poles, we put almost all of them underneath posters for another neighborhood cat, Neko, who had been lost for weeks. I’d noticed these posters everywhere before Xander got lost and I impressed with her people’s dedication to recovering her. 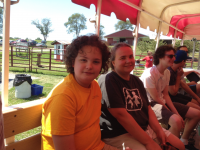 Beth and Noah responded to the problem with electronic communications. Beth posted to the neighborhood listserv and made a Facebook page for Xander where people could leave messages and Noah made a Google Plus page. I thought it was fitting Xander was now on more forms of social media than I am, given his highly social nature. 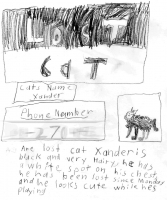 Noah also made a poster with one of those QR codes you can scan with a smart phone to get to one of Xander’s web sites. We started getting phone calls about sightings, but they were either of a different cat (one with a docked tail), or of a cat seen startlingly far from home, or on our block but days ago. Meanwhile, Beth and I were imagining all kinds of unhappy endings to this story. Had he really crossed our busy street as one of the sightings indicated? Had he crossed any other busy streets? Had he encountered a fox as one of our neighbors unthinkingly suggested? She meant well, I think. She was after all calling to say she’d seen him in her yard two days earlier. Was he lost? Had he had a heart attack? Years ago the vet noticed an irregular heart rhythm and told us that sometimes cats with that heartbeat up and die of heart failure with no warning in middle age. Beth, who’s good at worst-case scenarios, was even imagining he’d fallen into the clutches of a gang of cat-torturing kids. I told June happier stories. Maybe he got lost and another family was taking care of him until they figured out where he lived. June thought this was likely, and that he might have even planned it that way, in order to expand his social circle. She was not particularly worried and confident he would return. Noah made no predictions, but he did tell me quietly that he missed Xander. Matthew was unsettled and howled so much at night that Thursday night we let him sleep with us, and that seemed to calm him. Meanwhile, June determined to take matters into her own hands and make her own hand-lettered posters but she only had time to make one before school Thursday so after long discussion, she decided to give it to the bus driver because she goes all over the neighborhood. Friday morning June made another poster and Noah and Beth helped her scan it and make enough copies to give out to all the kids who ride her bus, as they were the most likely to live in the neighborhood. (June’s in magnet Spanish immersion program so some of her classmates live in other parts of Takoma Park or in Silver Spring.) Beth was trying to get Noah to stop helping with this project and focus on getting ready for school. He was so late she had to drive him to school. While they were walking down the driveway, Beth thought she heard a meow. She hesitated because she’d been thinking she heard meows all week, especially while in the kitchen, which faces the driveway. “I hear meowing,” Noah said. So they started looking in the windows of the house next door until Noah saw Xander’s face in a basement window. Noah came dashing into the house to share the news and soon all four of us were crowded around the window, looking at and talking to Xander, who was howling back at us. I need to stop here and tell you about the house next door. It’s been vacant since we moved here, in the spring of 2002. It’s not abandoned precisely because the owners do occasional, slapdash maintenance on it, but it’s in bad shape. In fact, it’s been condemned for a year or two. In the time we’ve lived next to it there have been squatters in the house and its garage. Once I saw a raccoon climb out a third story window onto the branch of a tree. There’s a broken basement window at the back of the house that seemed to be the only entrance into the boarded up house. As I was peering into the basement I noticed another cat, an orange cat with a pink heart-shaped tag on her collar. It was Neko! We had found not one, but both missing cats. The problem now was freeing them. From the broken window they must have used to enter the basement to the floor was a long drop. The window was unfastened and swung inward but there was a metal frame dividing it in two. It wasn’t clear if we could get a ladder through it or if an adult would fit. We didn’t know how to reach the owners of the house; we don’t even know their names. Beth called the police non-emergency number and they referred her to animal control. She was informed they only come rescue feral cats and as neither cat was feral, they couldn’t help. Next she called Neko’s people, one of whom came over at once to see if it really was Neko. It was. By this point Beth had left to drive Noah to school. I showed Neko’s person, Kevin, how the window swings inward and he said, “You know, since the window is already broken, it would only be entering.” I agreed, but said we should wait for Beth to get back. He went home to change clothes and fetch his fiancée. Beth got back before he did and we started looking for other points of entry into the house. I noticed the windows around the corner were much closer to the floor. We couldn’t open the first one we tried, but the second one was open and covered with wire mesh that looked like it would come off pretty easily. I went inside to get her a hammer and she set to work. She had it almost off by the time both Neko’s people arrived, Kevin now wearing a sweatshirt that said, “Deny Everything.” Xander came out with minimal coaxing. I carried him back into our house and June cried, “Xander in the house!” I hear it was a little harder getting Neko out because she was more spooked but eventually Kevin was able to reach in far enough to pull her out and wrestle her into her carrier with his fiancée’s help. I had just enough time to pack June’s lunch and get her to the bus stop, where I shared the joyous news with everyone. When I came back I saw Xander made a quick tour of the house then collapse under the dining room table and fall deeply asleep. Oddly, he didn’t seem ravenous. He’d eaten some food I lowered through the window in a small plastic tub on a string before we got him out of the basement but he didn’t finish it and he didn’t eat again immediately upon getting home. I am still wondering what he ate and drank in the three and half days he was gone. And how long he was in that house. We are all happy to have him home, though Matthew was initially angry, as he often is when Xander’s been out of the house for a while. I’m not sure if it’s the strange smells Xander brings back or if he’s mad at him for worrying him. Anyway, there was a lot of hissing yesterday but they have made up enough to sleep on the same bed. I went for a walk this morning and took down all our Lost Cat signs as well as quite a few of Neko’s. And this afternoon Beth went to the hardware store to buy wire to cover the broken window because while we probably can’t keep Xander in our house forever, we do want to keep him out of the house next door.